Did a bit of winter decorating outside last week. It’s going to be 71* here tomorrow, but I’m still holding out hope for a good snow! I keep a wreath on our front door all year, it’s my way of saying: welcome, come in! Do you guys keep something on your front door year round? 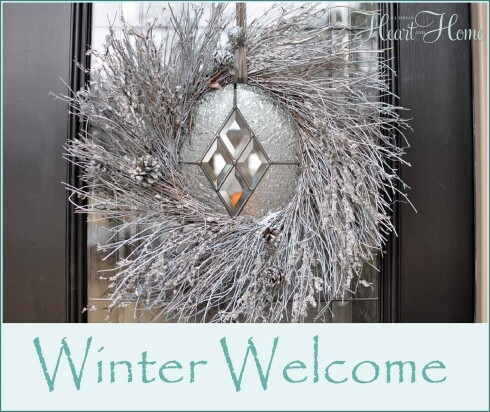 The winter front door wreath is easy to make with a bit of spray paint and a few picks. It’s just a brown twig wreath from JoAnn’s. This wreath reminds me of the trees this time of year, branches bare and beautiful. I spray painted the twigs silver and then went over them again with white spray paint. A few pine cones and icy picks, (because you know, I’m a fan of inclimate weather) and just like that, you’re done! My vintage red sled is tucked in the corner and I’m ever on the prowl for a pair of old ice skates to drape over the top! Anybody seen any in the Atlanta GA area 🙂 ? I always have a wreath on the front door and change it out with the season. I love the sled it gives a pop of color. My front door is plain white, so I always keep a wreath on it. Last year I made some wreaths out of straw wreaths and some Bernat Boa yarn chosen with colors that matched each season. We are headed up into the 60’s next week too. I heard from our weather guy out here that some changes are in store though. While we will stay mild and dry for quite awhile, the rest of the country will become much colder. Maybe there is hope for snow for you, yet! So welcoming! 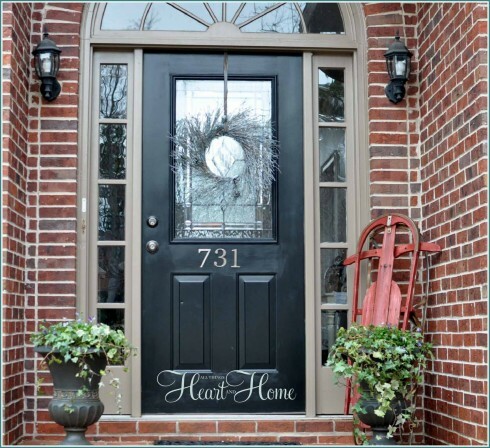 I forgot to order my wreaths this year and alas, I have nothing on my front door right now… it does look a little barren. BUT, we do have a good ole blizzard bearing down on us sometimes tonight or tomorrow-so the snow part, I will totally have… oh how I wish I could just share some with you!